IIn honor of George Keller, former professor of Visual Arts at the Bloomsburg State Teachers College, turned lion trainer and circus performer, the Andruss Library Special Collections has over 30 books with a focus on Circuses and Wild Animal Training. •	GV1803 .H35 2008 “Fall of the Big Top: The Vanishing American Circus” (2008) by David Lewis Hammarstrom looks at the history of the circus from 1793 to the present. The book explains the shift from the big top to “circus ballet,” and focuses on the differences between the circus now, and then. It also includes numerous photographs and in-depth interviews. •	GV1803 .H64 1990 “Step right up! : the Adventure of Circus in America” (1990) by LaVahn G. Hoh & William H. Rough Author LaVahn Hoh was a Professor in the Drama Department at the University of Virginia where he taught the only accredited college course on the circus. "Step Right Up!" intends to take the reader back to the circus days to relive the feeling, memories, sights, and sounds of the American circus. The book includes over 250 pages of researched text and more than 300 photographs. •	GV1815 .D78 “The Pictorial History of the American Circus” (1957) by John and Alice Durant. To write their book, the Durant's thoroughly researched the American circus and have the circus itself as one of their sources. •	GV1811 .C25 1988 “I Never went to Clown College : the Ramblings, Recollections and Reflections of a Circus Producing Clown” (1988) by Frank Cain who preformed many different roles in over 30 circuses between 1942 and 1956, most often as a clown or a member or the band. •	GV1811.H86 A3 1954 "Story of 'Mr. Circus,'" (1954) by Charles T. Hunt, Sr. as told to John C. Cloutman. 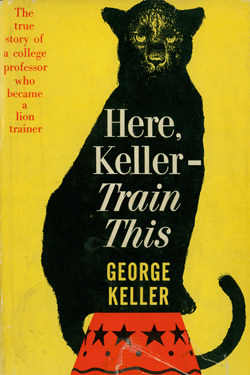 •	GV1829 .K38 1962 Keller's own book, “Here Keller- Train This,” (1961) which describes his transition from professor in the small town of Bloomsburg, Pennsylvania, to performer in Ringling Brothers and Barnum & Bailey Circus. •	GV1829 .K4 1957a “No Bars Between” (1957) by Alex Kerr. Kerr looks at animal training from a psychological standpoint, he is known for his extensive knowledge and understanding of animal psychology, which he learned through years of observation of his favorite 'big cat', tigers. •	GV1829 .P7 “Lions, Tigers, and Me” (1956) by Roman Proske, a noted lion tamer who experienced more than one close call, describes his life as a trainer of lions and tigers. The book starts with how he decided to become a wild animal trainer and continues right to the end of his exciting and risky career. •	GV1829 .B42 "Jungle Performers” (1941) by Clyde Beatty and Earl Wilson takes a look at Beatty, one of the world's foremost trainers of lions and tigers, and his experiences with the "Four Brothers," four deadly cats. This book concentrates on the dangers behind training lions and tigers. All books in this collection are available in the Andruss Library Special Collections, located in the University Archives area on the 3rd floor of theHarvey A. Andruss Library.